It’s well-known that we’re all wired so aromas trigger emotions and memories. In fact, the postage stamp-sized olfactory lobe, which is in charge of smell, is also part of the limbic system, which manages emotions and long-term memories. Imagine drifting off in a cloud of aromatic nostalgic happiness while crafting a delightful personal essential oil blend. Doesn’t it seem lovely? Blending essential oils is all about inhaling! 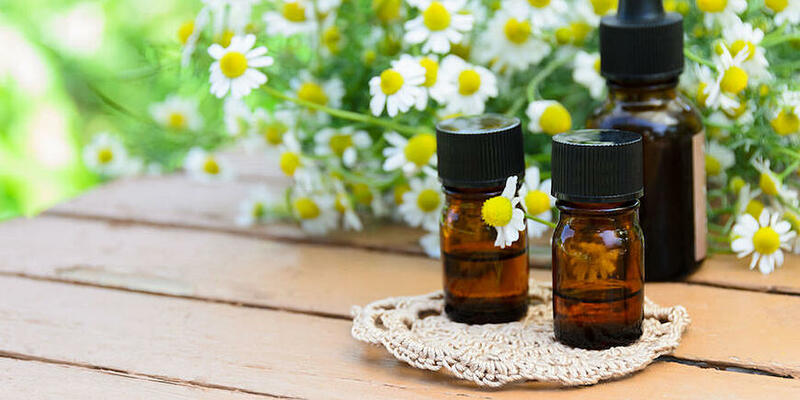 For those of you who are brand new to essential oils and aromatherapy, one of the best ways to begin creating personal fragrances is by experimenting with combining essential oils that you love from the very first inhale. You can then experiment with using your blends in diffusers, soaps, and room and body sprays. While this is a fun and creative process, blending essential oils is an art and science that takes a bit of skill and knowledge. It’s helpful to have a few tools in your toolbox when creating your perfect essential oil blend. With that in mind, here are some essential oil blending and aromatherapy fundamentals. To start you blending today, I’m going to limit the scope of this post to essential oil blending basics. But if aromatherapy fragrance blending with essential oils is a serious topic of interest for you, there are a lot of excellent books and classes you can take, including ACHS’s AROMA 101: Introduction to Aromatherapy course. You: Ah, I just love the scent of lavender. Friend: Really? Lavender’s not my favorite. But lilacs smell delicious! Everyone is unique, so every person will connect with fragrances differently as each person’s memories surrounding that aroma will be different. Creating aromatherapy blends is a personal and creative activity, so it’s helpful to remember to start off blending essential oils that you love and then branch out to creating perfume blends and natural products for others. The first skill you’ll need to develop is identifying aromas. Perfumers and aromatherapists catalog aromas into components or “notes.” The language is very similar to the language of music, like the notes of a chord. An individual essential oil can be categorized as a top, middle, or base note. It’s important to know that oils can have components of all three notes, so you’ll notice that each oil can have a top, middle, and base note. However, individual oils can be predominantly categorized as a single, dominant note. For example, bergamot Citrus aurantium (L.) var. bergamia is a top note. So when we blend, we choose oils from each category, essentially creating an aroma chord. Top Note: This is the first noticeable impression in a blend, and is often the characteristic feature of the oil. It springs swiftly from the aroma, has a sharp tone, and does not last long. Body or Middle Note: An essential oil that is a middle note will last for longer (about one to two hours) on a perfume testing strip. The middle note of a blend can also be referred to as the “heart” or “bouquet” of the aroma. To begin, choose essential oils that you believe will create a pleasant aromatherapy blend. Go ahead and get creative! Start inhaling! Don’t worry what category they fall into (top, middle, or base). Keep it simple: choose five essential oils to begin with. Do I like the zest of any specific herbs and/or spices? Do I yearn for the smell of any specific flowers? Do I love crisp, green aromas (like freshly cut grass, a pine forest, or after a rainfall)? Perform an organoleptic test on the oils you’ve chosen. Place one drop of each essential oil on a perfume testing strip. Slowly draw the strip to your nose, creating circles in the air about a foot away. It’s helpful to note at what distance you begin to notice the aroma. Hold the testing strip to your nose, breathe in quickly at first, and then take a few slow, deep inhales. This is where you may want to start taking notes. Use any words you can to describe the images, thoughts, feelings, and sensations you experience. These could be shapes, textures, colors, sounds, emotions. Is the aroma heavy, sharp, dark, woody, loud…? Let the essential oil evaporate for 10 to 30 minutes. Take a moment to get some fresh air or sniff some coffee grounds to clear your olfactory senses. Next, smell your testing strip again. Notice if the aroma is heavy or light. Did the initial aroma last long? Use terms such as mossy, fruity, floral, and green to describe the fragrance. Try to identify the main trait of the note. Is it nutty, grassy, or musky? Let your imagination run wild. Try envisioning the fragrance as a shape. Is it square, sharp, level, rough, round, boxy, large, or tiny? Close your eyes and imagine the fragrance with a personality. Describe this. Is it friendly, spunky, seductive, shy, or charismatic? Be cognizant of your body. How do you feel physically and emotionally? Is your essential oil volatile, darting quickly up your nose and into the space between your eyes? Or has the oil traveled straight to your chest? Concentrate and take notes on where you feel the essential oil in your body and spirit. See if you can separate your five chosen oils into top, middle, and base notes. Ideally, you will have at least two top, two middle, and one base note. Now you have your five oils, it’s important to consider the aroma strength of the oils you’ve chosen. Remember, strength is different from evaporation rate (how quickly the aroma evaporates from the testing strip); be careful not to confuse the two. If one aroma is very powerful, you would not want to blend equal amounts of that into a formula as it will dominate. A great example is lavender Lavandula angustifolia (Mill.) blended with Roman chamomile Chamaemelum nobile (L.) All. Chamomile has a much stronger aroma than lavender. Therefore, you need a bit more lavender to compensate—otherwise, the chamomile will overpower the blend. To complement the aromas of both lavender and chamomile, you need to blend four to eight drops of lavender with one drop of chamomile. You can start by creating an aroma wand: a few drops of the five oils you have selected on five separate perfume strips. Create a fan with these strips in your hand so you can waft them back and forth in front of your nose all the while inhaling. This is the time to adjust your ratio based on aroma strength. A good rule of thumb is to start by basing your aromatherapy formula on 100 drops to help determine the percentage of each essential oil in your blend. Of course, you can increase or decrease the formula provided you maintain the ratio. Remember there is really no right or wrong—this is your blend. If it does not turn out quite how you envisaged, don’t be discouraged. Aromatic bloopers can be useful around the house for cleaning—but that is another blog post! Bottom line: nothing needs to go to waste. While you’re formulating, remember to be mindful. Stop, inhale, and let the aroma lead you to your next choice. 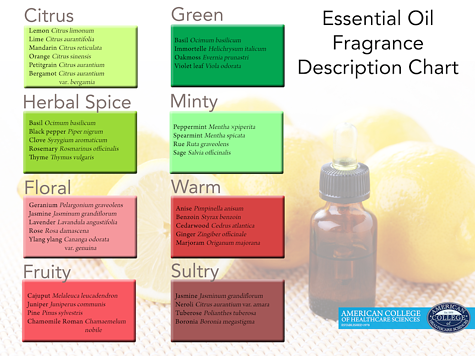 If you have difficulty deciding on which oils might be a spice, herbal, green, floral, etc., take a break and study the fragrance description chart (below). Remember, creating a blend is not a competition or a race. Take your time, be creative, and let your senses guide you. Tiffany described this blend as fresh and clarifying yet grounding (good ol’ vetiver!). The peppermint is strong at first but wears off a bit once it has been exposed to air. The blend changed over the hour and became a bit tamer than at first. So get out your essential oils and mix and match your 100 drops to find the blend that blends best with YOU. Let me know how it turns out and report back in the comments. If you're ready to explore even more ways to enjoy essential oils and aromatherapy, check out our free eBook, Aromatherapy Everyday Basics.